Can I reserve one for my car? Yes. Thank you for your support! Will also reserve you the later drive pieces and mounting pieces for the later 6 rib belt. To think a "V" belt or the early 3 rib belt will drive one of these monsters is ridiculous. Porsche figured out they couldn't do this, reliably, with just over 100 amps! Let me be the first to say..
We'll install it when I bring Mr. Leaky down for warranty inspection. Just makin sure you saw this. Thanks Greg! Looking forward to my "GB928" in the future. Just not counting it, because I don't have to build it and Mary doesn't have to ship it, right now. Such great products coming out of GB's shop. OK! for us OB/SOB folks. Now my car has the S3 PS/Alt bracket, and obviously the crank pullet to go along with it. The exchange from my GM unit to the Uber unit took all of about 20 min. and most of that was due to having to pull up the shark fan shroud to get the long bolt out (not needed with the new bolt provided). photos are pretty self explanatory. MM pics are at idle, and at idle with every single thing i can turn on turned on. On the drive home in LA traffic i used my Laptop (mega squirt system/Tuner Studio) to watch the voltage that the CAR sees. not just at the jump post. never dropped below 14v, even when heat soaked in traffic. lowest i ever saw was 13.7 when coasting to a stop, and it recovers to 14v in a heart beat. i will report more on real world results as i DD this baby. Because my alternator is equipped with a one way clutch on the pulley, the alternator will freewheel when the engine slows down rapidly. That is why you see a voltage drop, which instantly recovers. As I recall, the GM conversion was supposed to be better than the stock alternator. 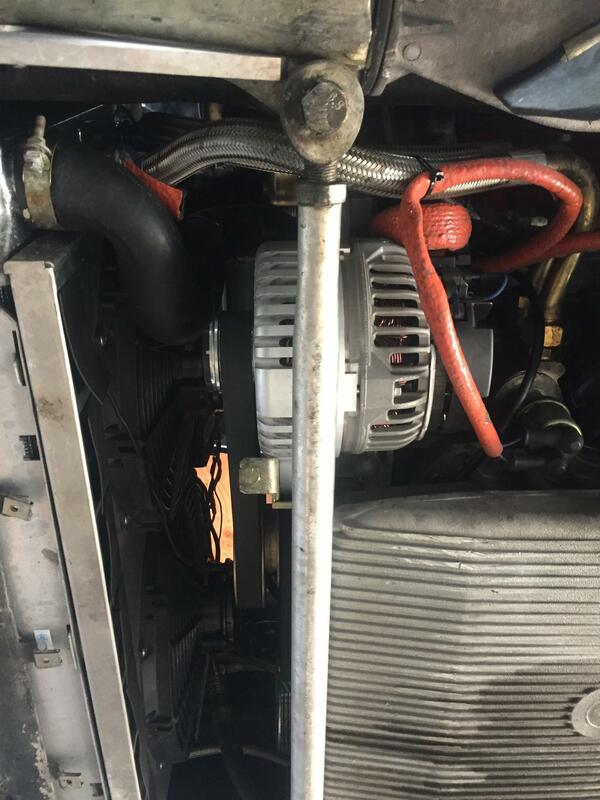 Any idea of what the output of the GM alternator would be, in the same drive? Yeah, when letting off the throttle after accelerating past 4500 or so, there's a very tranisent dip on the voltmeter as the pulley freewheels. Like a manifold pressure gauge when the the blowoff valve operates. Scratches head again. 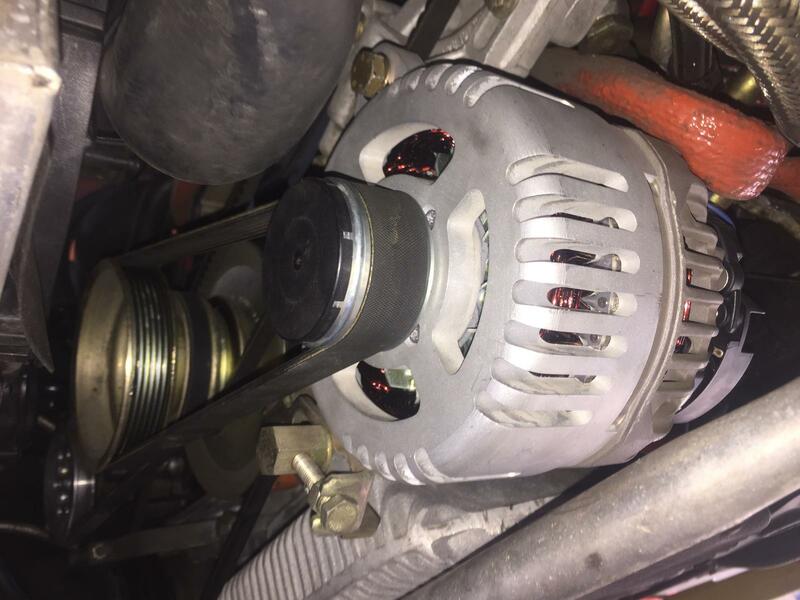 The alternator speed will never be less than the crank drive speed, always at or above idle speed while the engine is running. 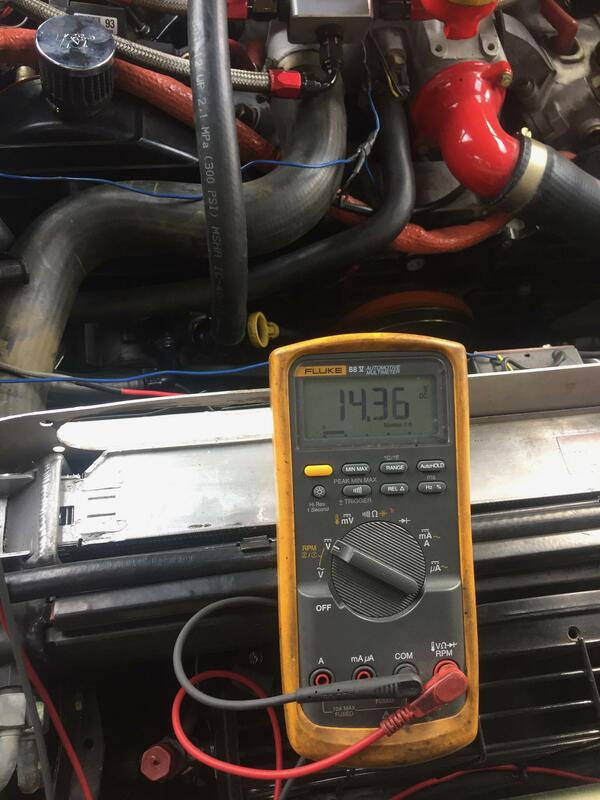 Meanwhile, Rob and Jake's tests show that the alternator will deliver enough current to maintain about 14 Volts even at idle speed. No reason to expect the voltage drop. In fact, you are selling the idea that there won't be one. The one-way clutch seems like it won't do much if anything an auto gearbox car. Just the rotating mass of the crank plus the torque converter would seem to prevent rapid crank slowdown on throttle lift. Any real-world feedback on that yet? Nope. When we work on Mr Leaky, we'll install it. I disn't initially think much about this one way clutch until I saw it in action....this "piece" is very new, to me. While I knew it would come into action when the crankshaft quickly quit spinning (engine shutdown), it also makes sense (to me), that it must also work when there is a rapid deceleration of the engine, like when shifting or slowing down. 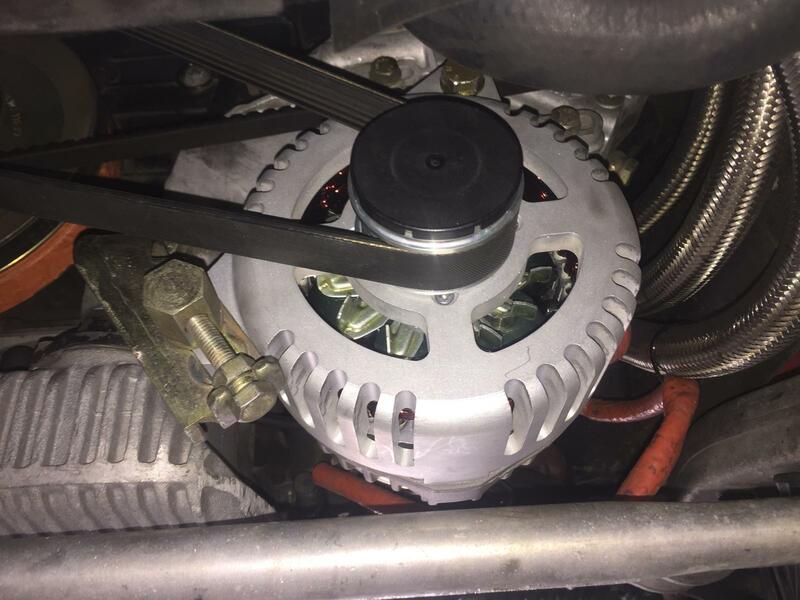 While the alternator obviously is making its own resistance to turning because it is working to produce electricity, it also has an inertial factor involved.....that armature is spinning very fast. If the engine slows quicker than the alternator, the one way clutch seems like it should come into play, until the rpm requirement equalizes....taking all of this load away from that belt, which would normally have to "absorb" this rpm change. I'm thinking that the rapid transient drop in voltage output while slowing or shifting, with the rapid return to prior voltage output might be a sign of this activity. My actual total knowkedge of what is happening would only occupy a couple of your brain cells....I'm just trying to be logical about what I am seeing. I'd be happy to hear a professional power generation expert's "spin" on what is really happening. Idle voltage looks good. What temp conditions apply. 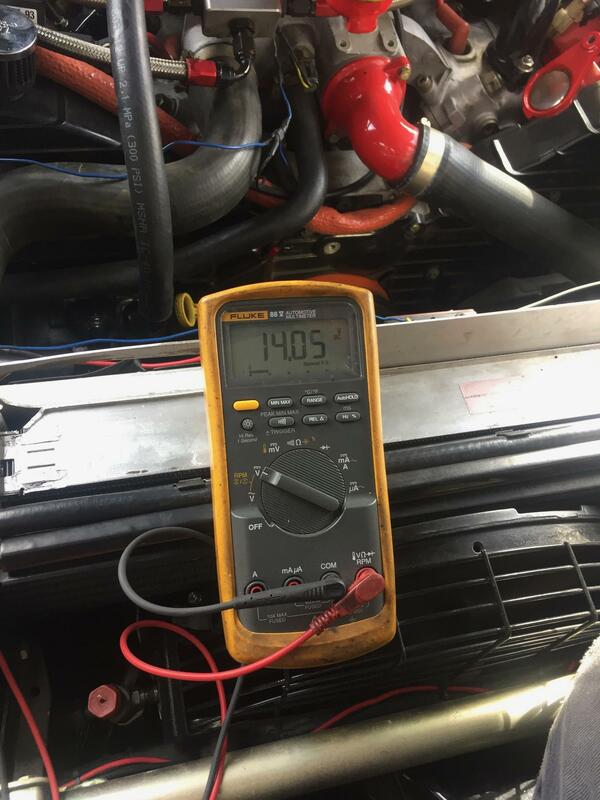 I find with a hot engine on a hot day, the voltage goes down. Nice product. As usual from Greg. Greg, during the same drive with the GM alternator, when hot id see about 12.8 at the ECU/CE panel, and at hot idle a tad less than that. now nice an cold/fresh in the AM i could see around 13.8 at idle but it did drop pretty harshly due to heat soak. This week i will take my IR gun with me and take some immediate temp readings and MM reading when stopped after stop and go, and freeway driving. I can tell you that after the drive home yesterday and getting home, and getting the kiddo in the house the case temp (id say about 10 min) was 93F. but I'm surest cools off fast. Superb Greg........looks and performance.........I'll take one please. What Dr Bob says - there is no explanation for a voltage drop here... 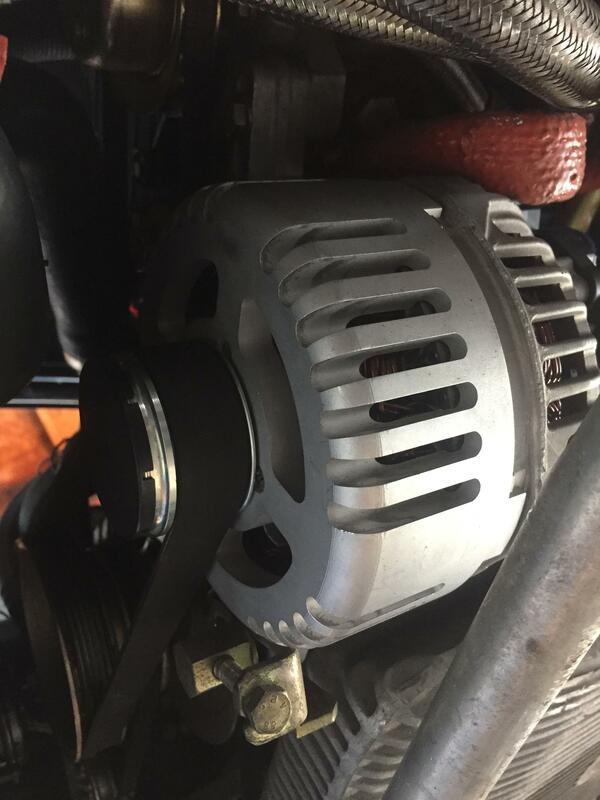 The one way clutch allows the alternator to spin faster than it would without the clutch - not slower. It will always spin at least at the crank RPM * Crank:Alt pulley ratio and is allowed to spin faster than that on deceleration - so while 'freewheeling' it can generate better not worse. 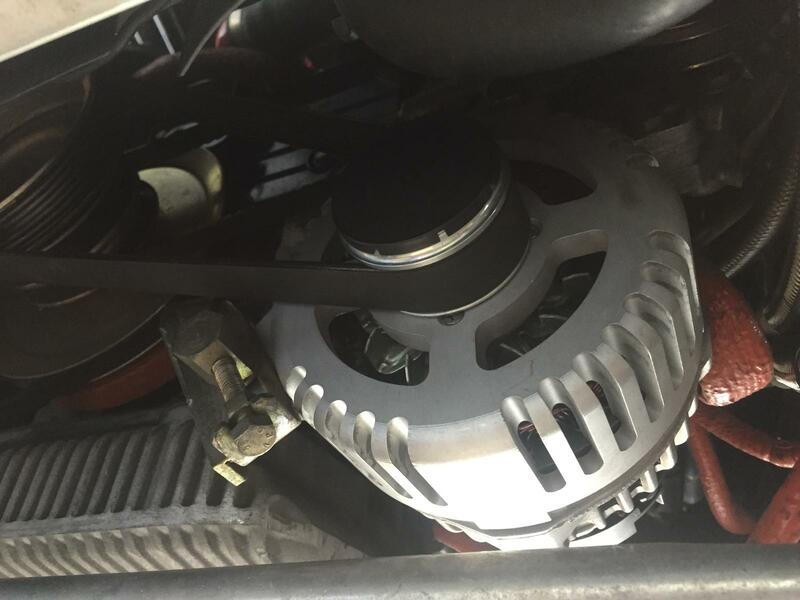 There are other alternator pulleys available - the Litens OAD clutch pulley has not only a freewheel mode like this but also a soft drive decoupler to soften the impact of engine pulses on the belt and provide a smoother drive - avoiding common causes of belt slip and extend the belt life.